We popped by a few weeks ago and had a chat with Mr. Kong, current owner. 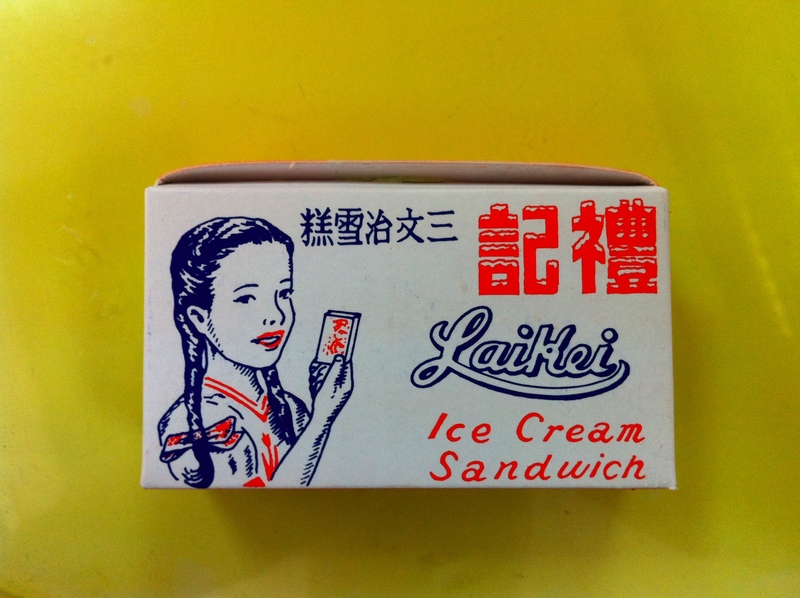 Lai Kei was established 70 years ago by Mr. Kong’s grandfather, who worked in an ice factory where he learned to make ice cream. 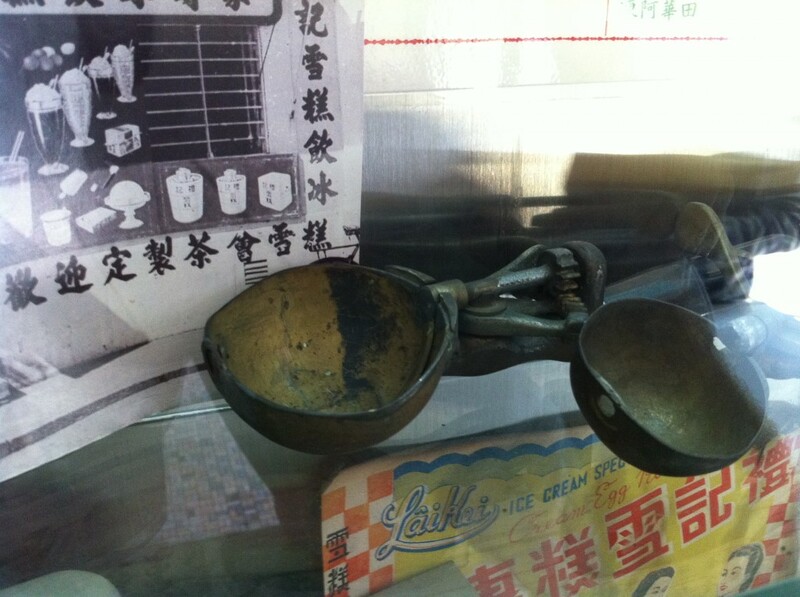 The entrepreneurial man began making ice cream on his own, selling it out of a cart on the streets. 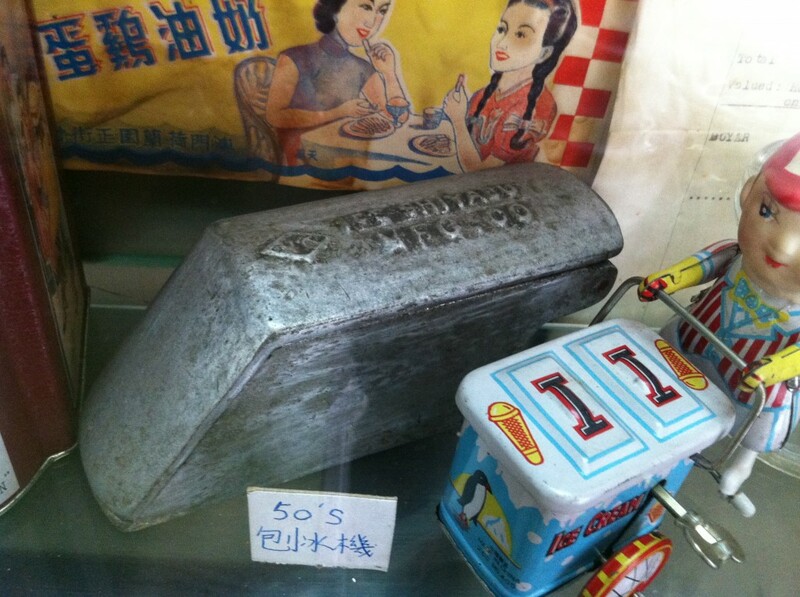 (Mr. Kong himself sold ice cream out of a little basket in the streets when he was a young child). 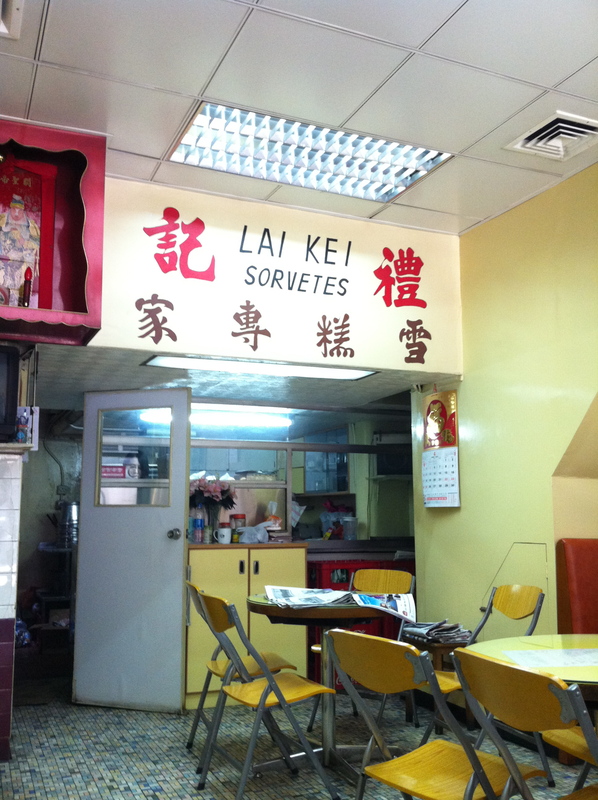 Lai Kei came to its current location 40 years ago, and its interior has remained, for the most part, intact, save for several new coats of paint, and the installation of air conditioning in place of fans. This is actually fairly common in Macau, where the pace of change has been much slower than Hong Kong’s. While Hong Kong businesses feverishly updated their interiors to keep up with the latest trends, Macau didn’t give a fig. And we are thankful for that. This sign is the original streetsign from the shop’s second location, more than 40 years ago. 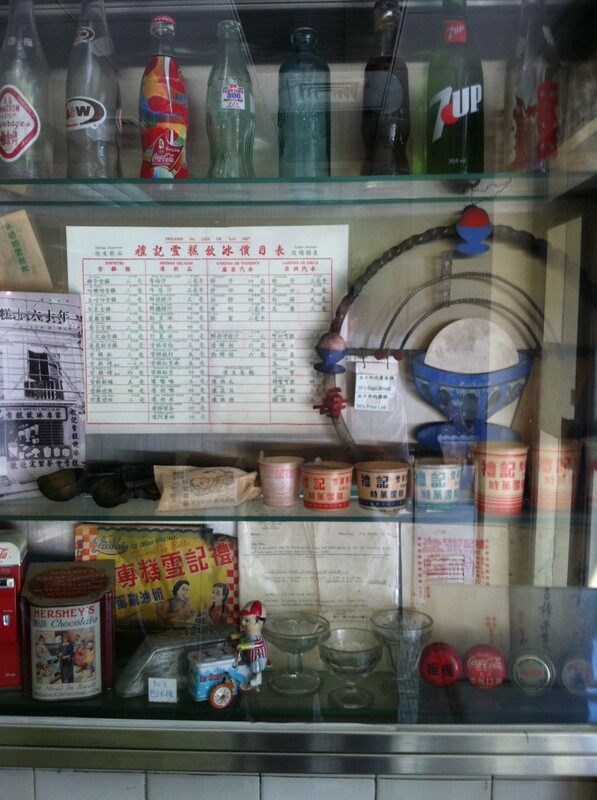 In the front of the shop is a display case, assembled by Mr. Kong’s father, filled with a nod to yesterday. 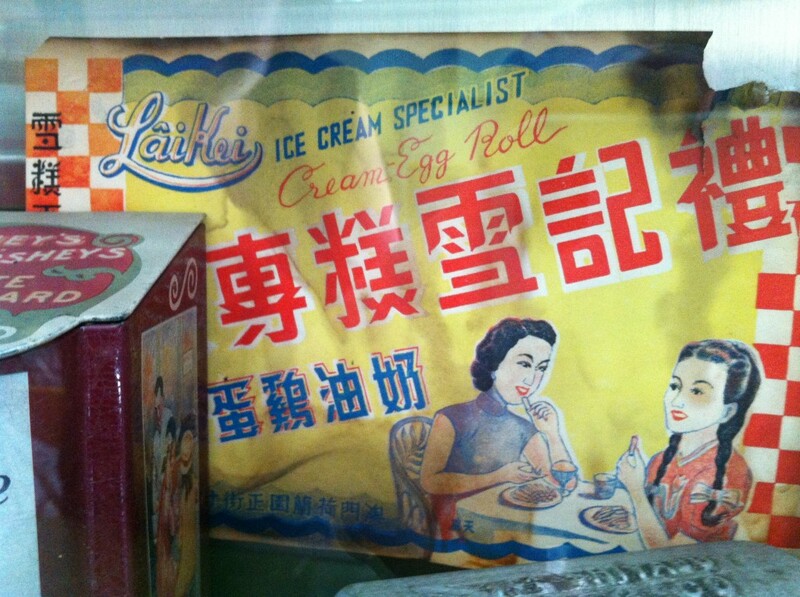 On display we found old packaging, the original shop signage, cups, vintage ice cream scoops, receipts. (See below for more pics of that). 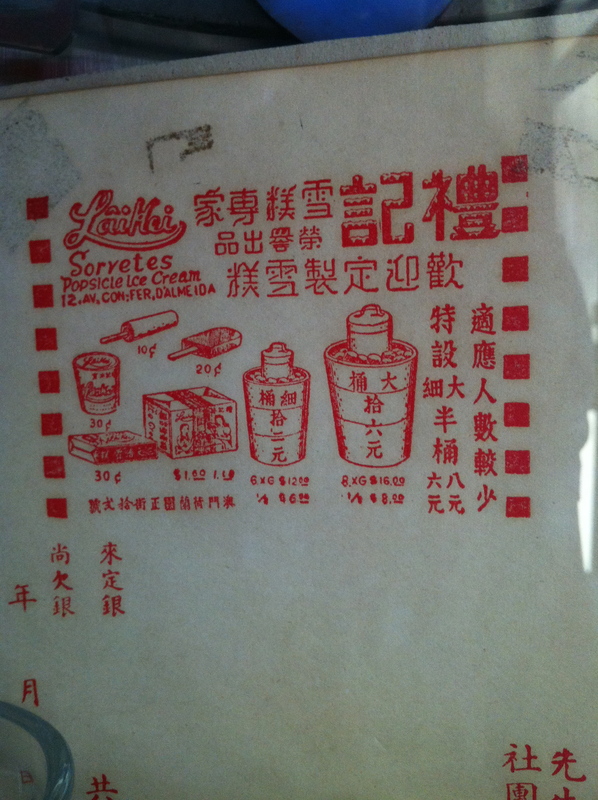 The packaging for the sweets is adorned with line drawings of pretty girls, drawn by Mr. Kong’s grandfather way back when. Small wonder that Mr. Kong himself is a designer by trade, having studied in California and working in advertising before taking on his family business. 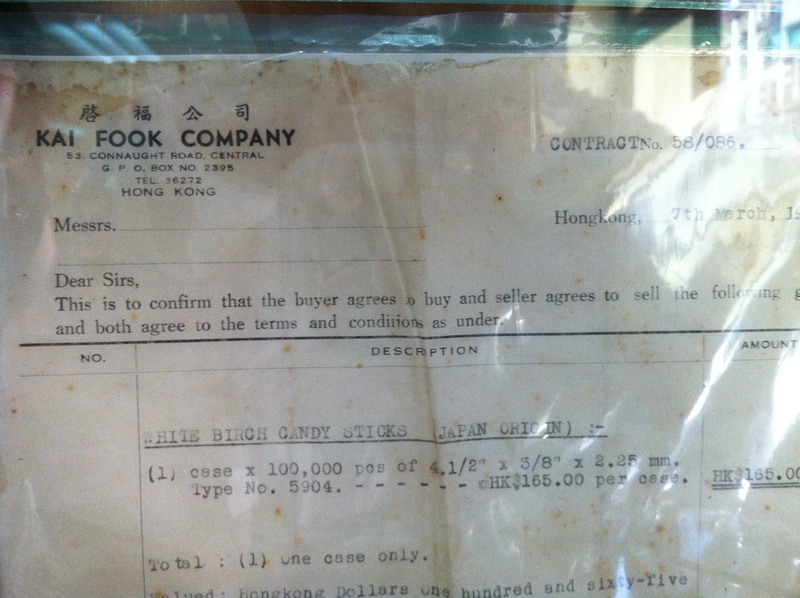 The original packaging was yellower, because Mr. Kong’s grandfather didn’t have access to bleach. Mr. Kong also took it upon himself to photoshop out some stippling in the original drawing, since it looked like blemishes. DELICIOUS! 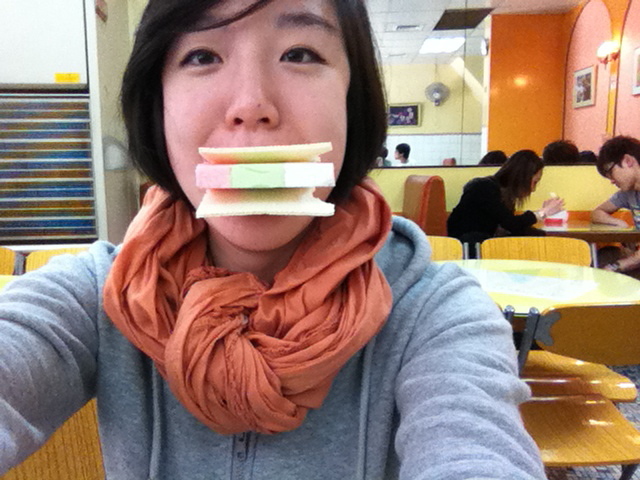 We had two fan favorites: an ice cream sandwich (strawberry, honeydew, and coconut) and some hong dow bings (red bean popsicles). The ice cream sandwiches, at $10 each, remind us of the white mystery Airheads! 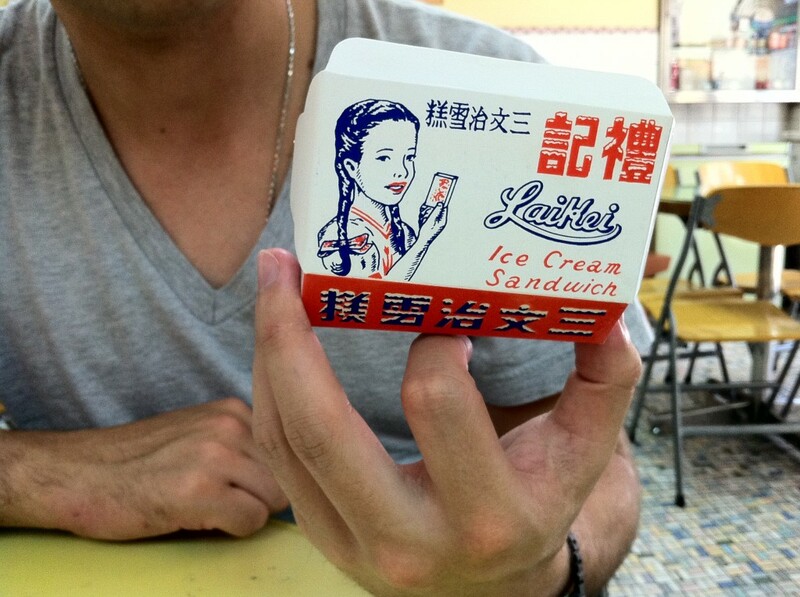 Each ice cream sandwich is composed of three random flavors. There’s no hint on the packaging of what flavors lie within. Kids apparently love the surprise. We loved the surprise. That makes us kids. My favorite was the coconut. ICE CREAM SAMMICH MONSTAAAAR! Strawberry, honeydew, coconut. The red bean popsicles sell for $5 each, and are packed with chewy beans. 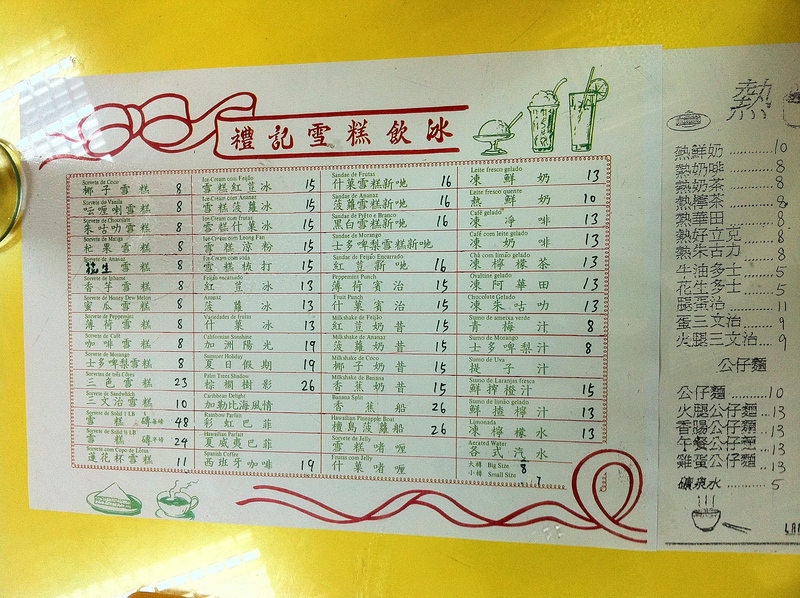 Mr. Kong says the most popular ice cream flavors are coconut, mango, taro. Lai Kei has seen generations pass through its doors. Mr. Kong remembers, as a child, seeing teenagers wooing each other at the very tables we were sitting at. Many couples came back married. Today they come back with children in tow, filling their little heads with nostalgic stories. Just as we fill yours! Now for some more pics. 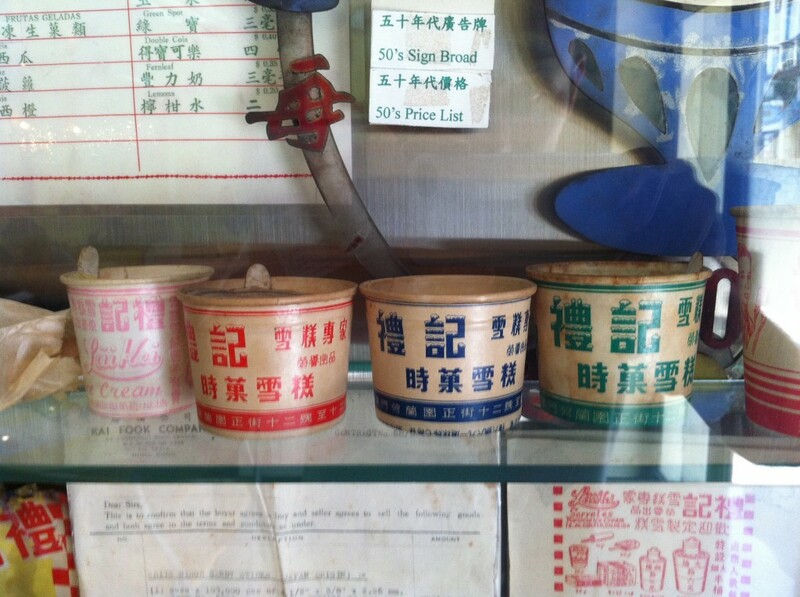 Before plastic cups enjoyed widespread use, the original Lai Kei ice cream cups were made of paper, but the ice cream would soak through. Lai Kee added a layer of wax, but people ended up accidentally scraping it off with their spoons and eating it! Back when phone numbers only had five digits. 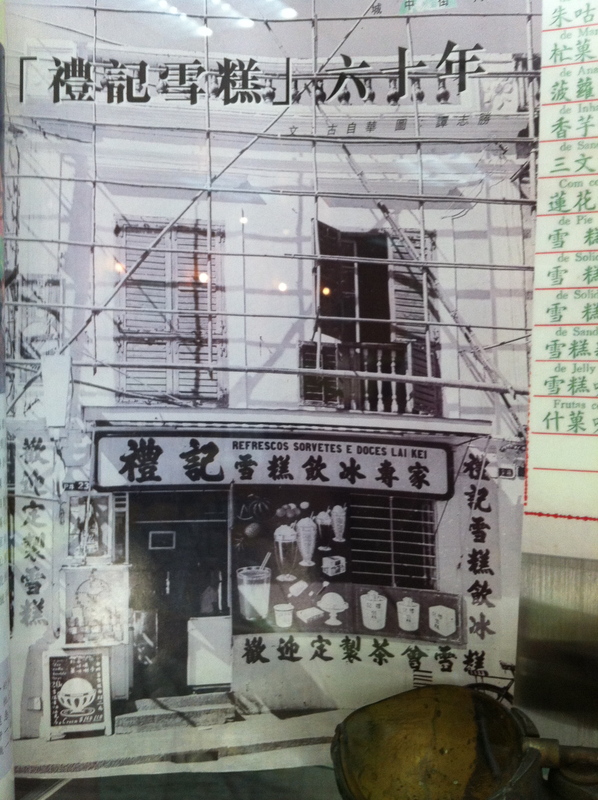 Lai Kei in the ’60s. We’re really glad that places like Lai Kei exist. Have you ever been? What other places feel like you’re stepping into a time machine? The sandwiches look divine. You will have to take me there someday. Remember when we thought Neapolitan ice cream was Napoleon ice cream? 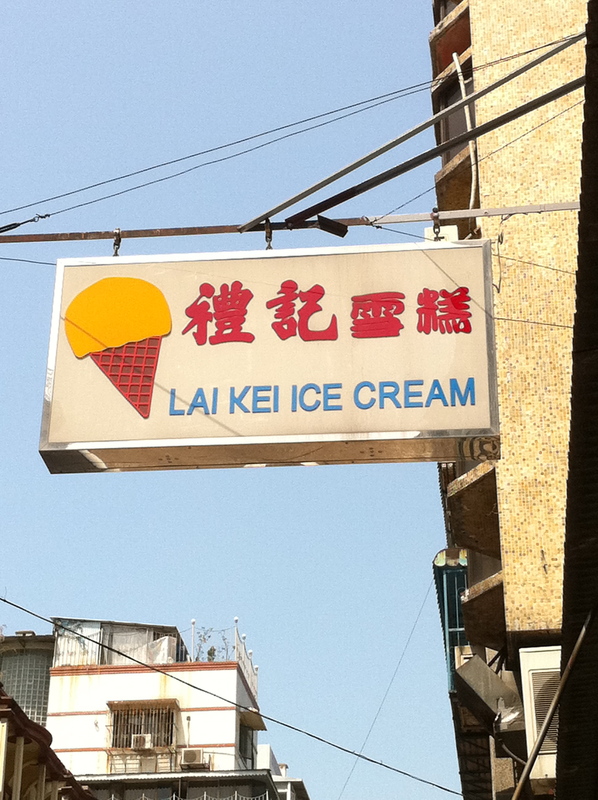 when the dat tat monster goes lai kei, ice cream! I love this!! 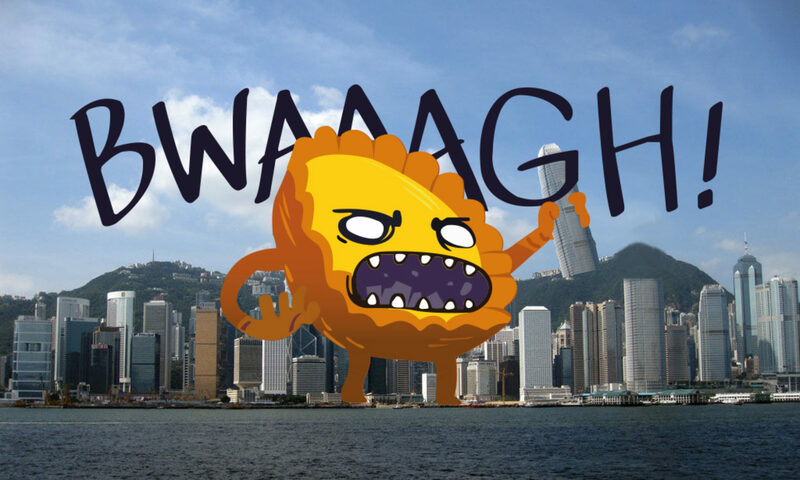 this is what you said you’d do way back when you moved to HK, it’s your calling! I feel like i’m in a time machine when I go to B&H Dairy Lunch on 2nd and St. Marks because breakfast is $4 and there are haggard old men at the counter and there are russians in the kitchen who call me senorita. The two favoured items are absolutely delicious. I always stopby to get a few dozens of them to bring back to HK. The shopkeepers pack them nicely so that it keeps for a few hours without melting. The red been popsicles was only $1.5 when I first went there a couple of decades ago! Previous PostPrevious WE ARE DAN TAT MONSTER!!!! !